Doctor Who celebrations kick off with The Science of Doctor Who! And so it begins. The build up Doctor Who: The Day of the Doctor kicks off next week on the 14th November 2013 at 9pm with The Science of Doctor Who with Brian Cox on BBC Two. In the program, the ever popular physicist (and former keyboard player with 90’s band D:REAM) will present a lecture on the science behind our favorite Time Lord’s adventures. He will be joined by a number of celebrity guests (which I suspect will include some Who fans and actors). 15th November 2013 at 7.05pm sees BBC Three start it’s Doctor Who: Greatest Monsters and Villains Weekend, where you are invited to vote for your favorite Who bad guys. They’re also running Doctor Who: The Ultimate Guide which is an intro to all things ‘Who’ (exact date tbc). CBBC are even getting in on the fun with 12 Again: Doctor Who Special (exact date tbc), where CBBC’s super fan Chris Johnson, impressionist Jon Culshaw, Tommy Knight (Luke Smith), Warwick Davis (Porridge), Neve McIntosh (Madame Vastra), Dan Starkey (Strax) Louise Jameson (Leela) and the Seventh Doctor, Sylvester McCoy all talk about watching TV’s top Time Lord when they were young. 21st November at 9pm sees the airing of the biopic penned by Mark Gatiss – An Adventure in Space and Time, telling the story of Doctor Who coming to our screens. It stars David Bradley as the 1st Doctor William Hartnell, Reece Shearsmith as 2nd Doctor Patrick Troughton. It also stars the brilliant Brian Cox – no, not the floppy haired scientist one, the actor one – as original Who producer Sydney Newman. Next up is a special of The Culture Show, called ‘Me, You and Doctor Who‘ on the 22nd November at 9.30pm on BBC Two, where lifelong Who fan (and historian) Matthew Sweet explores the cultural significance of Doctor Who. 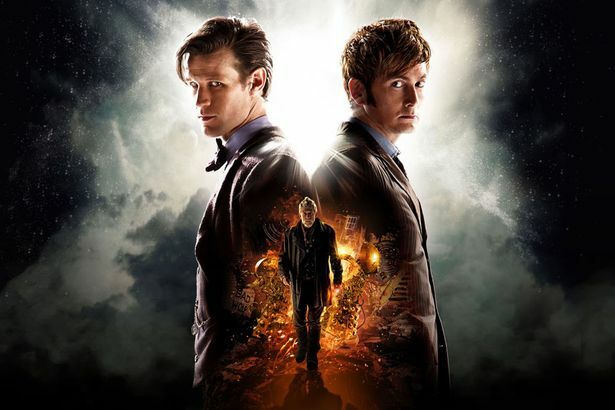 It’s then time for the main event, Doctor Who: The Day of the Doctor on the 23rd November at 7.50pm, which sees Matt Smith join up with former Doctor David Tennant, and erm… ‘other’ Doctor, played by John Hurt. And that’s just the BBC’s TV stuff, there’s also a load of radio shows happening over the coming month. It’s fair to say, we’re not going to be short on Who things to watch this November! ← Marvel (Disney) & Netflix bringing 4 new live action tv shows!! And about time I must say. Unfortunately, in my opinion it is too little too late. Steven Moffat promised to take over television this year yet it was left to Watch to start the ball rolling with the “Doctor’s Revisited” series. Such a pity that the 50th Anniversary year has been more of a damp squib than the massive celebration it should have been.